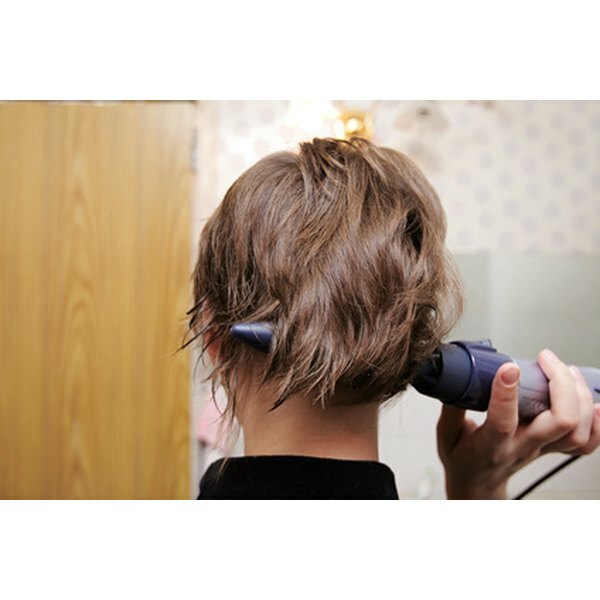 Constant use of heating tools on your hair will leave it dull and lifeless. Fried hair refers to hair that looks dull, thin, unhealthy and brittle. Many beauty salons offer treatments to reverse fried hair, but these treatments are costly and do not always improve the problem; they might even make your hair more dry. Treating your hair at home will save you and can make your hair glow again. Look closely at your hair to see if you have dry hair, split ends and breaking or frizzy hair. If you have two or more of these symptoms, you have fried hair. Stop the main causes of fried hair, such as chemical coloring or straightening your hair. Frequent hair washing—more than two or three times a week—also contributes to fried hair. Remove as much heat from your hair routine as possible, avoiding blow dryers, hot rollers and combs. Also avoid too much sun exposure for your hair. Cut your hair and have a short hairstyle for a while if the damage is severe. This might seem drastic, but once the damaged part of your hair is cut, it will grow back healthier. Shampoo only once or twice a week at most. Many people over-shampoo their hair—especially in the summer when they shower more frequently. Over-shampooing strips the hair of the natural oils that makes it shine. Wet your hair before applying shampoo, and use a mild shampoo with natural ingredients. If you have thin or fine hair, use baby shampoo. Gently work the shampoo into your hair; don't pull or rub in a rough manner. Massaging the head and scalp with your fingertips is healthy and can promote blood flow to the hair follicles. Use a pre-conditioner once a week when beginning your fried hair restoration and twice a month afterward. Rinse with warm clean water. Do not repeat shampooing in spite of what the shampoo bottle says. Use a mild conditioner, and let it rest on your hair for at least 30 seconds before you rinse it. Gently apply the conditioner through the hair, but do not pull the tangles. Rather, allow the conditioner to work them out. Rinse thoroughly. Pat your hair gently with an absorbent towel when you are finished, and allow your hair to air dry. Do not use a hair dryer or any other heat source. Apply a hair product with sun protection to your hair. Trim—or have your hair trimmed—every six weeks. Wear a hat in hot weather or under glaring sun to protect you hair. Drink at least 2 l of water every day. Hydrating is as important for your hair’s health as it is for the rest of your body. Minimize drinking caffeinated beverages and alcohol, and avoid tobacco products. Take a daily vitamin supplement that includes A, E, D and the B family. Use a deep conditioner that contains vitamin E and other antioxidants twice a month. Keep a bottle of distilled water with you, and wet your hair before swimming. It will reduce the amount of chemicals your hair absorbs. Wash your hair right after you swim in a pool. If you notice hair falling out or any other drastic conditions, consult your doctor immediately. Never take more than the daily requirements for vitamins F, A, D or E. These vitamins are not water-soluble and can build up in your body.